Another tall panel room came courtesy of Greg Takesh and his GT Audio Works GTA2.5 ($9k/pair). Greg’s been tweaking this design for years now, and each time, I come away more impressed. Shown here to excellent effect with some nifty looking Class A/B amps from Paradox Pulse ($6k each), and a server from Hollis Audio Labs. Triode Wire Labs provided the power and signal cables. Robinson Van hi ,hope nobody missed BEST i mean REALLY BEST SOUND at cap audio fest ..GT AUDIO WORKS speaker, with PARADOX PULSE AMPS & cables ect. "Please get a good listen to GT Audio Works GTA2 speakers in 319, standout sound at an affordable price." GT Audio Works created quite a buzz at NYAV — the price, now $3,495, is still rather modest by comparison to much of what you’ll find in audio’s high-end. And what you get is tremendous — big, hand-made 3-way panels with a pair of separate subs. Like I said, it’s a compelling package. Attendees were enthusiastic and the crowd moving through the room was robust and seemed steady throughout the weekend. The GT Audio works were loved by most everyone I spoke to at the NYC show this spring. Same for RMAF and a lot of people seem to like them a lot from Cap Fest postings. But the reviewers don't seem to want to talk about them. JA says they need more work yet and "had promise". Perhaps because it is a one man shop with no distribution? Perhaps because they shame other more costly stuff that advertizes in the rags? Seems a disservice to the man making them when the "regular people" like them so much. "The GT audio works hybrid speakers with subs sounded like giant killers at their $3000 price point in their 10 minute or so audition. Were I looking for a good pair of large full range speakers today I would have to look there. PLus, the rep in the room who I believe is the designer as well in this small upstart possibly 1 man company was very helpful and just seemed like a talented regular guy who just wants to make great speakers at affordable prices and knows how to. I noticed the bass was a little overwhelming at first during the demo and he did as well in that without any cue or prompting he made an adjustment in quick time that nailed it perfectly from there on. THe modest Bryston amp and CD player source used in this rig also got my attention for performance/value. This was the high value giant killer room of the day for me (in addition to the DIY room)." source and amp showed they belonged in a high end audio show as well." "GT Audio Works "GTA-2's" - Ribbon/planar/dynamic driver "hybrid" towers (with separate sub-woof cabinets for each side) that sounded real, real nice. Very well integrated, with cohesive sound top to bottom. Nice cabinet work, clean lines and a "no-brainer" price of $2995.00. My winner for the "Biggest Bang for the Buck" award!" Submitted by meivoho on July 17, 2012 - 9:42am. "In reference to the GT Audio Works - "Needs some more fine tuning before it is ready for prime time ??? !!!" I spent more time in this room than any other. These were the runaway best bargain of the show. The best speakers at 10 times the price !! With modest amplification they held up against some of the big competition... a giant killer !!!" The only planar speaker I saw there (and you may note here that I have a considerable bias toward planars) was the GT Audio Works GTA2, a planar magnetic speaker with a ribbon tweeter and two woofers added. It sounded very bright but very clean. That brightness might have been the result of the room (and it's clear they were trying to improvise some room treatment), and the speaker is definitely worth investigating. Another set of speakers I really liked were the GT Audio works GTA 2. they're ribbon tweeters and planar mid range with 8" woofers in each cabinet. 90 Db at 4 ohms and they sounded quite good. I was a little surprised by how the focus changed so sharply if you moved out of the sweet spot, but the sweet spot was damned good to stay in. As far as speakers go they were sort of budget speakers and well worth every penny. The GT Audio Works planar magnetics are the most cost effective speakers to come along in a while, and made in America! Great transparency, wide dynamics, accurate soundstaging, dissapear, play loud, sound good at low levels. I played all types of music ( not audiophile labels) and great recordings sound sensational, and mediocre ones still sound good. I just wanted to keep listening! I want a pair, and I hope a center will be in the works. Great job Greg! Not too far down the hall was the very elegant and affordable GT Audioworks GTA-2 planar-magnetic loudspeaker ($2995). All the audiophiles I knew were asking me if I had the chance to hear this loudspeaker. All this talk had my curiosity piqued so I visited the room and was amazed by size and sound of this incredibly affordable transducer. Planars by design have certain virtues that make them hard to dislike. First, their dipole in nature and this offers up an incredible open window into the music. The high frequencies are also extended, yet not exaggerated. This gives an added sense of sparkle to strings and the like while maintaining a natural stance. The problems associated with planars has to do with getting the dynamic bass drivers to keep up with the inherently fast planar section. I neglected to hear any discontinuity, though I admit, I was standing, due once again, to a lack of seats. Duly noted, the room was a little too small to fully accommodate more than a few listeners, and given the chance to kneel down from a good position, I was easily attracted to the transparency, speed and body - compliments of dual 8" woofers I suspect. Lastly, word circulating around the show on this particular room was extremely positive. In fact, it was one of the most talked about rooms at the show. For only $3k, there's plenty to like in this new GTA Audioworks loudspeaker. The great news is they're conveniently located right here in New Jersey. Nice. The GT hybrids + 2 dedicated subs were A LOT of speaker for the money. A am not a hybrid fan aka Martin Logan in general but I know these can sound very good in a certain way and the GTs did once the subs were adjusted better for the material playing. At first, the bass levels/mix was a tad off. The sound was definitely more modern and in line with what I remember these types of hybrids to sound like in general. I was impressed though not sure these are exactly my cup of tea, but again, A LOT of speaker for the money and lots of potential. The fullness and impact and overall presentation including detail most resembled the Classic Audio room of the rooms I heard. Not saying they sounded the same, but definite similarities in regards to weight and meat on the bones. That's no small achievement for a $3000 speaker system with entry level high end electronics (smaller less expensive Bryston amp and CD player) running them. The double subs clearly were a part of that once tuned in well. 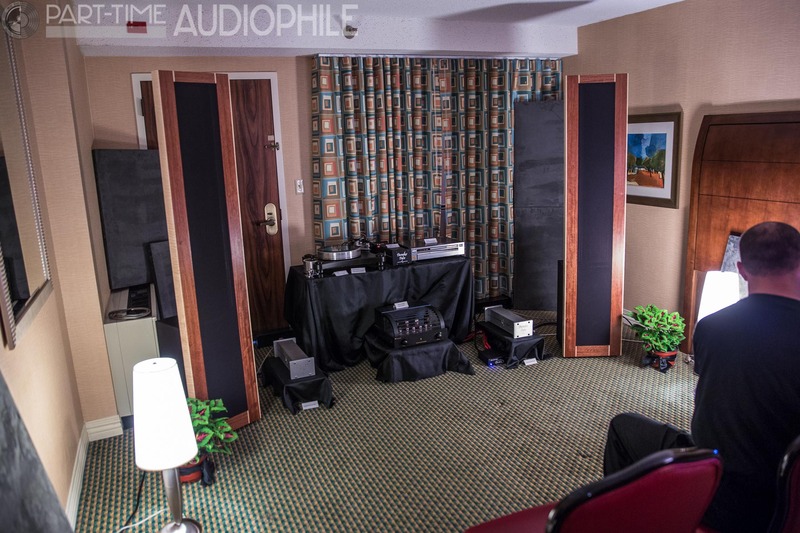 "One of the most talked-about rooms was put together by GT Audio Works"
I think the Stereophile guy sold the GT Audio works rig a bit short, probably due to unfamiliarity and not enough time to listen. I would have liked to heard more but for $3000 including two separate standalone subs, these were the giant killers there that I heard. Has anyone else heard these new speakers? I heard them at the Capital Audiofest and they were shown at the NY Audio show. Greg Takesh has done an incredible job with his design, especially for the price. I played all kinds of music for over an hour and they sounded great, very transparent, wide and deep soundstage, full range, detailed at low volume but can play loud without strain. How loud, we drew complaints from the hotel guests at the end of my Friday session-LOUD! Musical, albeit overused, is how I would describe them. I just wanted to keep playing music, not just audiophile recordings but regular music. Keb Mo, Fleetwood Mac, Eagles, Earl Klugh, Diana Krall, Styx, James Taylor, Flim & The BB's, Holst Planets, Jazz at the Pawnshop, Tracy Chapman, Joni Mitchell, Green Day, Stones, Cat Stevens, Coldplay, Rodrigo et Gabriella and Santana are some of the artists I listened to, I enjoyed all of them and didn't want to leave the room. These have a ribbon tweeter, planar magnetic mid, 2 light 8" midbass units in the tall tower, and 2 powered 8" separate subs, all for just over $3K. It's a line source about 6.5' tall, the ribbon and planar magnetic drivers appear to be about 48" long, and it's a 4 ohm load at 90db efficiency. Made in the USA, New Jersey. Great job Greg!